Conveniently close to Pigeon Forge, this cabin is minutes from all of the attractions, shows, dining and shopping! Upon entering the cabin, you'll be taken aback by cathedral ceilings and beautiful views of the mountain. When you are finally able to pull your eyes from the mountain view, you will find that the cabin offers a fully equipped kitchen for preparing meals during your stay. When it's time to eat you can gather at the rustic, wood kitchen table, where you'll have seating for 8 or at the extended counter which has 3 bar stools. The living room offers plenty of plush seating, a stacked stone fireplace that extends to the ceiling, a large HD television with DVD player and plush seating all positioned perfectly for hours of talking, lounging and entertainment. This 3 level cabin offers a full arcade and theater experience complete with a pool table, a PacMan unit with 60 games (galaga, dig dug, etc), multiple racing arcades, a Jurassic Park shooting system, and more, all of which are set on freeplay! Downstairs you will find the custom theater room with a 9' screen and surround sound! You'll be entertained for hours in theater-style seating for up to 12. A Bear's Kind of Fun can host a large group comfortably with 4 rustic bedrooms. Starting with the master bedroom, you'll find a black aspen king bedroom set and 37" HD television. You'll have your very own bathroom with a romance-inspiring jetted tub and shower. The second and third bedrooms also have a king bed with 37" HD televisions.They share a bathroom that has a shower/tub combination. The bunk room is a smaller bedroom with a full size bunk bed. The fourth bedroom has a bathroom with a shower. As you walk outside onto the deck you will find that it extends around 3 sides of the cabin and is perfect for enjoying the beautiful view and scenery courtesy of the Great Smoky Mountains. The deck also offers a log picnic table, log rocking chairs and a large premium Jacuzzi hot tub which seats 7. Plenty of places to take in the view and fresh air. There is so much to keep you busy in this cabin, even if you choose to do nothing but relax at the cabin, we're sure the kids won't mind! Our cabins will take your breath away from the moment you arrive. We have cabins that offer all log interiors, open floor plans and wall to wall glass. Once you experience the luxury, fun and beauty of our cabins, you will never want to leave. All of our cabins offer fully equipped kitchens including dishwasher, microwave, coffee maker, cappuccino maker and washer and dryer. All of the video games in our cabins are set on free play. Our multicade games have 48 to 60 games from the 80's such as PacMan, Galaga, Dig Dug etc. Every cabin also has a hot tub on the deck. We provide all linens that you will need, as well as starter supplies of soap, laundry detergent and dish soap. You may need to bring some extra supplies if you are staying for more than a few days, as these are intended as a "starter" pack. We take pride in our cabins. Each cabin is well maintained and clean. Let me start by saying the cabin is great and we had a great time. There are a few things that I feel are over stated in the add. The game are there but none of the two player games worked for both players. The projector needs a new bulb badly. You can only see the screen at night if all of the lights are off. The also need a better grill. We cooked each night and had to bring our own grill because it is a small park style grill. Lastly, the hot tub has a leak so we had to add water twice and less than half the jets worked. I don’t want to sound like we didn’t enjoy ourself because we did, however it just needs some TLC and it would be amazing. We would rent with this company again just maybe a different cabin. This place has it all! View, Location, Room, Games, Theater, Jacuzzi, Hot Tub, New Appliances WOW! Let me start by saying that I've been coming and staying in this area for over 15 years. I stayed a week this time. First.The view off the front deck is Amazing! We even walked through the woods checking things out. I thought the location was perfect. Took me 10 minutes to get to a Food City, Family Dollar, Gas Station and liqueur store. Just minutes from the arts and crafts district. I could get to Gatlinburg in 15 minutes and took less than that to get to Pigeon Forge. The ride up to the cabin was perfect for me and really lets you know that you are on a mountain! The rooms all had plenty of room with nice size closets and dressers to put all your clothes and things in. Plus plenty of Tvs to catch all the action. Oh and we really liked the decor. We really enjoyed the games! I own Atlantic Arcade Sales and it was a breath of fresh air to see a cabin with many different games. Typically these cabins will have 1 multigame cabinet with the same ol games. Not this cabin! There is something for everyone to play. The theater is wonderful. I could sit everyone I know in it and it comes with Netflix , Hulu, Youtube and more already hooked up and ready to play, plus the sound is really good!. Also has a dvd player if you need it. We spent a few nights watching movies on Netflix and my son caught up on one of his shows. I made good use out of both the Jacuzzi and the Hot Tub with plenty of room on the deck and nice rockin chairs to stop and take in the view. I also made good use of all the new appliances. From the fridge, dishwasher, washer and dryer. All new and I wish I had those at my house. I would and will stay here again. For once it's nice to get more than you pay for! 1. “Conveniently close to Pigeon Forge, minutes away from all attractions, etc...” - this cabin is located 15-20 minutes away from any of the venues listed, not including seasonal traffic. 2. “The cabin offers a fully equipped kitchen for preparing meals ...” - this cabin is NOT ready to prepare meals; very few dishes, not sure there were any pots/pans. 3. “This cabin offers a full arcade & theater experience with pool table, PacMan unit, racing arcades, a Jurassic Park shooting system, and more …” - this was one of the main draws to this cabin for us and boy were we disappointed. Jurassic Park was down & inoperable. The rest of the games are in shambles. The pool table felt was coming apart and the table was unlevel. No point in trying to play, between the lean and being squeezed into a loft area that was too small for it. 4. 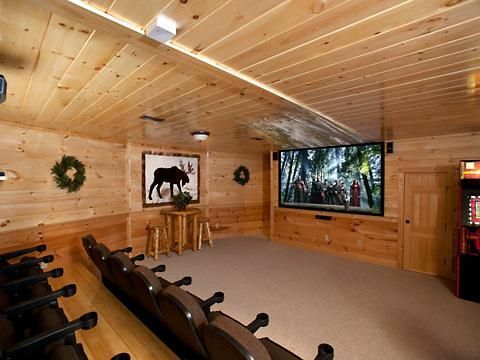 “… you will find a custom theater room w/ 9' screen and surround sound …”. - this was probably one of the most aggravating issues we ran into. We had purchased a new movie to view with the family, but the projector was out of focus and the frame shifted off the screen. We were able to adjust this because we have a home theater; but, a “layperson” would probably not have been able to do this. The projector is very dim making the picture difficult to see, and the DVD player froze up at least a half dozen times before we could ever get the movie going. SO FRUSTRATING! 5. “Starting with the master bedroom, … you'll have your very own bathroom with a romance-inspiring jetted tub and shower.” - the box spring on the bed squeaked all night and not for the right reasons. The sandpaper linens might have been purchased at a discount store on clearance. What makes this worse is the sign that is posted about linen replacement cost - $80!. The fun part about the “romance-inspiring” shower is that it is phone booth sized, the shower head leaked terribly, we had to tie a towel around it just to use it. A terrible disappointment for a "luxury master bedroom". 6. “Premium Jacuzzi hot tub, seats 7”- it might seat 7, but only one set of jets work, all the jet valve controls are messed up. Basically, you're sharing a bathtub! This was a pricey cabin to have this # of issues. Probably won't book FunZone again. She emailed me right after her stay letting me know that she was going to leave me a bad review. I personally went to the cabin to check things thinking that we had some real issues. There are more than enough pots and pans, plates, bowls silverware etc for 20! There was only one game down at the time, which we are working on either getting fixed or changing out. They had turned the jets off to part of the hot tub. I didn't have a problem with the theater lighting, but it was later in the afternoon, I'm not sure what the issue was. Had they had any issues, she should have given us a call and we could have helped resolve anything, such as turning the jets back on the one side. I understand that we can not make everyone happy but it is frustrating to have a review that is an outright lie. Many of these things such as the amount of dishes, the theater and the jacuzzi were. We can not control seasonal traffic. If you are coming during the busiest time of year, you should expect traffic. The cabin is about 10 to 15 minutes if you drive 15 miles and hour down the mountain and get into a bit of traffic, it is 3 miles from the main Parkway. We can't control how busy it is. Please read all of our reviews when deciding to book or not book with us. Her comment is she probably wouldn't book with us again. If it was that horrible, why not would not book with us again? We really enjoyed this cabin with our family from France. Young and old had a wonderful stay ! Was a great time. Wish we had more tv Chanel’s and a better more accessible pool.